Bob leads a discussion with area science students. The Junior Science and Humanities Symposium (JSHS) is a national program designed to encourage high school student involvement in original research and preparation for careers in science, mathematics, engineering and medicine. The Greater Washington Symposium is a two-day celebration that includes tours of area science and medical labs, seminars with scientists and on Jan. 9, I was happy to be asked to speak to more than 100 aspiring young scientists from the Washington area about my profession, science in general and my career as the keynote for this year's symposium. As part of the two-day event, students submitted research papers describing their research at area schools. The symposium participants are selected by area science teachers and come from Maryland, Virginia and D.C. public, private and parochial schools and come from grades 9-12. Three of the students receive regional JSHS scholarships and a number of area students will also represent the Capital region at the National JSHS in Colorado Springs, Colo., this coming April. 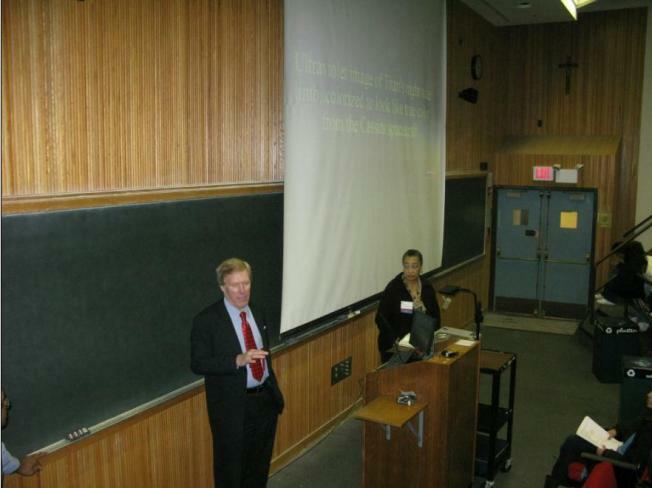 I spoke at the Georgetown University Medical College auditorium. Georgetown University hosts the area two-day symposium, which has been organized by Dr. Joy Williams, Associate Dean of Students and the Special Program Director of Greater Washington Area JSHS. This is a wonderful program. To learn more about how you, your students and your school can participate visit the JSHS web site at http://www.jshs.org/.